My partner in cooking crime, Casey, and I flew to New York City last weekend for Foodfest 2012, a four-day, whirlwind celebration of my 35th birthday that centered around our shared passion: food. These experiences left Casey and I with a shared lexicon of playful words and one-liners that will last us a lifetime, but the pinnacle of the trip was our education in cheese: in the classroom at Artisanal Premium Cheese and in the cool, temperature- and moisture-controlled cheese caves at Murray’s Cheese Shop. We participated in one class at each location. Our instructors differed in personality and teaching approach, creating distinct classroom experiences for their diverse group of students. Despite those differences, we all united to commune in cheese love. Erin led the classroom in exploration, urging us to focus on the texture and aromas of the cheeses as they mingled with the wine we drank. We learned that some combinations enhance the flavor of the wine or the cheese or, in ideal pairings, both. I found the occasional bad pairing fascinating. I never would have imagined that two of my favorite food groups had such potential to sabotage one another. It was truly an illuminating experience. Piper’s Pyramid, USA, Goat: Dusted with paprika, mild but slightly pungent. Good introductory cheese. Casey and I both liked it paired with Tempranillo. I thought it had a similar effect to that of beets, a natural complement that improves the flavor of both the wine and the cheese. Ossau Iraty, France, Sheep: Union of France and Spain; contains more protein, vitamins, and minerals than cow’s or goat’s milk. I thought resting at room temperature improved its taste and gave it two hearts. Casey gave it three stars and an enthusiastic “I like it!” We both thought it paired well with the Muscadet, and it improved my perception of the Primitivo. Epoisses, France, Cow: Erin and her husband courted over this cheese, which provides an opioid chemical effect that encourages bonding, similar to what occurs between nursing mothers and their babies. The aftertaste was a bit bold for me, but it lessened when I breathed out through only my nose (mouth shut). It reminded Casey of her dad. We enjoyed this paired with the Chenin Blanc. Casey thought it married well with the Tempranillo. 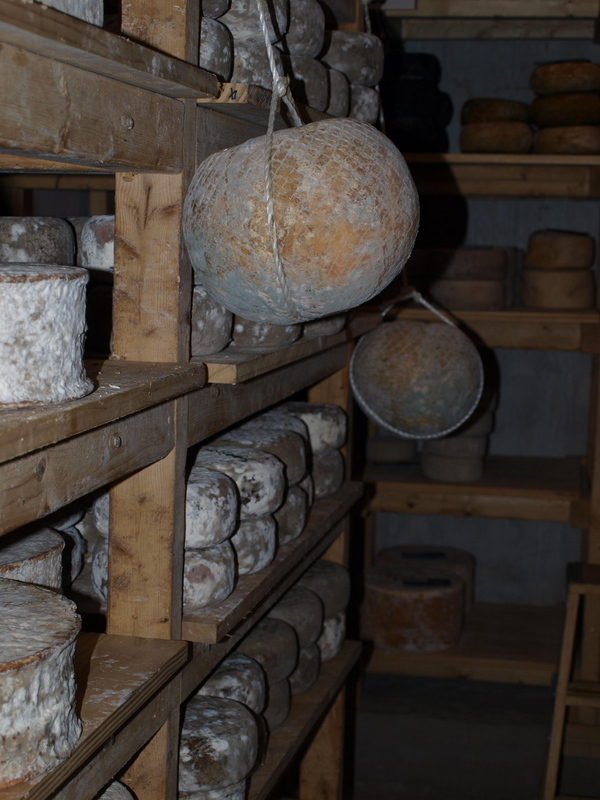 Beaufort Chalet d’Alpage, France, Cow: Grass-fed cows with a diet rich in Alpine flora, very flavorful. Wheels typically weigh between 90-130 pounds, requiring two milkings of 45 cows to make one wheel. Though delicious on its own, Beaufort scored neutral to low in all four wine comparisons. Valdeon, Spain, Cow and Goat Mix: Milder blue, salty profile, creamier rather than crumblier, wheels are wrapped in sycamore leaves that contribute to their flavor. Our appreciation of the Valdeon improved with all of the wine pairings. Selles-sur-Cher, Aged on site, Goat: We sampled this at two ages. I liked the creamy, lemony young version. Casey preferred the aged variety, which was drier in texture, tasted “goatier,” and had a salty, umami-rich rind. Berkswell, England, Sheep: Granular with sugar deposits from amino acids in the milk, smells like pineapple, with a rind reminiscent of the skin on a ginger rhizome. Recommended with a smoky Pinot Noir. Fourme d’Ambert, France, Cow: Creamy, “tame” blue cheese with a salty finish. A lady sitting across from us declared it “smooth and sassy.” It is purported to “convert even the staunchest blue cheese hater,” and is excellent paired with tawny Port. Wow. What are great story, Jules! I am going to convert to cheese!